Do I have to Give Up Marbling? No. 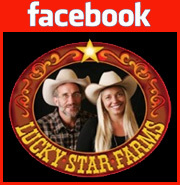 When you order Lucky Star Beef, you can be assured of high quality flavor and tender well marbled meat. All our beeves are young 100% Angus cattle, that are bred for high carcass quality and excellent marbling characteristics. Our beef is Dry aged for 14-21 days which further enhances the flavor and naturally tenderizes the beef. Meat with little or no marbling will have very little flavor and usually not be as tender. Most grass fed beef advertises itself as “lean” and this often translates to inadequate marbling. In order to grade USDA “Prime” which only 2% of US beef accomplishes…the meat must be well and finely marbled throughout. Although we have never requested a “grader” to visit our processor and “grade” our beef, we assure you that Lucky Star Grass Fed Beef does not sacrifice marbling. Our beef are finished on grass at exceptional average daily gain rates which are usually accomplished only with feedlot cattle. And their diets are HEALTHY for them. 100% natural vegetarian grass, forbs and legumes, naturally grown and grazed by the cattle at their leisure. We use bulls Registered by the American Angus Association with genetic characteristics to naturally enhance the desirable features of our herd. Our cattle are not crossbred but purebred Heritage breed Angus cattle originating in the counties of Angus and Aberdeen, Scotland and brought first to the Americas to Victoria Kansas in 1878. They are good mothers, good natured, highly adaptable, early maturing cattle. Because of the excellent marbling quality of our beef, you should not need to adapt or change your recipes or cooking methods to accommodate our grass fed beef. Although our beef is lean in nature, its fat composition tends to be well distributed throughout the muscle lending itself to intense flavor and a superior culinary experience. After our beef is dry aged, it is cut to your specifications, packed in airtight vacuum sealed BPA free plastic and flash frozen. We recommend that you request steaks to be cut no less than 1″ thick, the filets even thicker. Roasts can be ordered anywhere from 2 to 5 pounds or even more depending on your family’s needs. 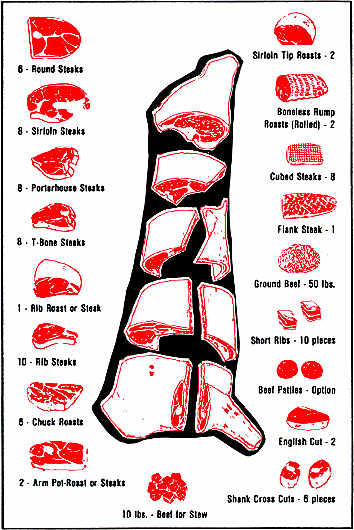 Below is an example chart of what cuts you might expect to get when you order a side of beef, twice this for a whole and half for a split side (quarter). We do not sell front or hind quarters but rather “split sides”. This way both customers receive an equal half of the chuck, the round, If you are wanting a quarter only, you may want to order and split a side with a friend if you have special requests for the meat cutting order, otherwise you will receive a “standard” split side order with half the tenderloin, half the rib cuts, etc. When ordering a side, you can order the loin to be cut into filet steaks or a tenderloin roast but not both. You can order T-bones or KC strips but not both. The round can be ground for ground beef or cut into stew meat or roasts. You will need at least 8 cubic feet of freezer space for a side of beef. One cubic ft (12″x 12″ …think milk crate) of freezer space will hold about 30lbs of frozen beef. The average kitchen freezer compartment is too small to accommodate a side of beef, but you might squeeze a quarter of beef in there, though there wouldn’t be much room for ice cream. 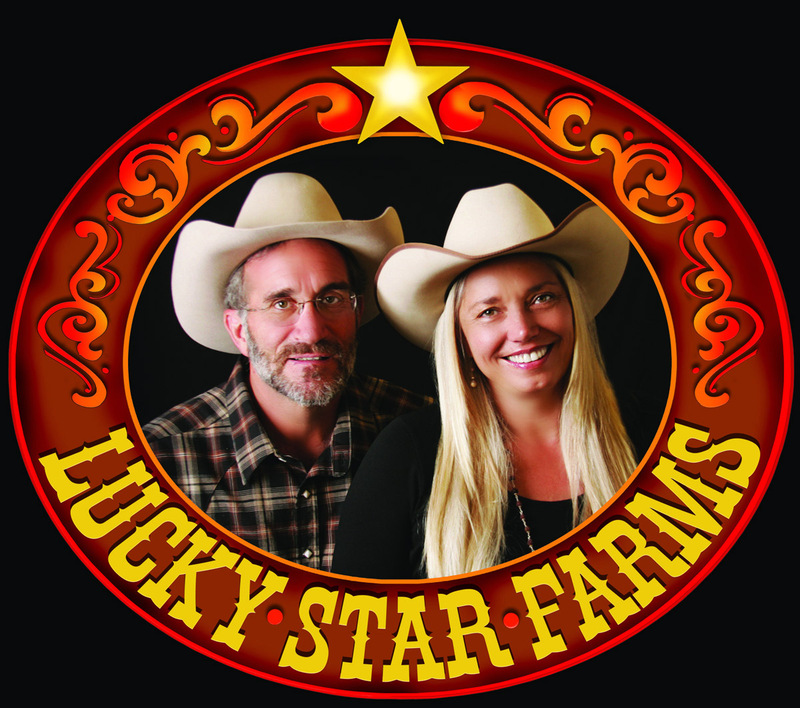 Lucky Star Beef will keep in the freezer easily for six months to one year. The meat is flash frozen and vacuum sealed in heavy plastic and well protected. We have never experienced any freezer “burn” with this packaging. Below is an example of how many and which cuts of meat you will get in a side of beef. Also, check out the beef cuts poster link for more ideas.